Saturday June 18th 1921 We girls all went to town in forenoon. Did some shopping. I got one hat re-trimmed and a new one. Afternoon resting. After supper Cora drove us over town. 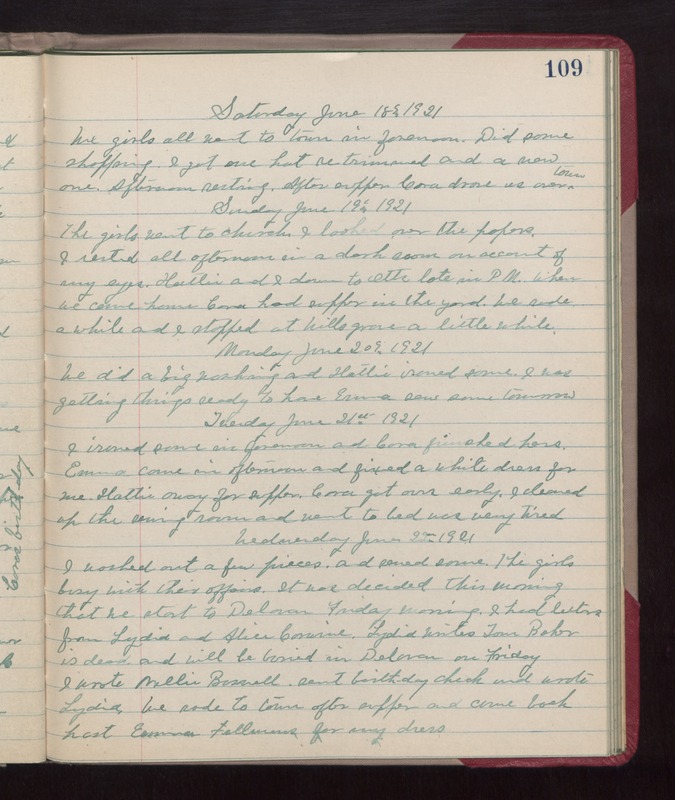 Sunday June 19th 1921 The girls went to church. I looked over the papers. I rested all afternoon in a dark room on account of my eye. Hattie and I down to Otts late in PM. When we come home Cora had supper in the yard. We rode a while and I stopped at Wills grave a little while. Monday June 20th 1921 We did a big washing and Hattie ironed some. I was getting things ready to have Emma sew some tomorrow. Tuesday June 21st 1921 I ironed some in forenoon and Cora finished hers. Emma came in afternoon and fixed a white dress for me. Hattie away for supper. Cora got ours early. I cleaned up the sewing room and went to bed. Was very tired. Wednesday June 22nd 1921 I washed out a few pieces and sewed some. The girls busy with their affairs. It was decided this morning that we start to Delavan Friday morning. I had letters from Lydia and Alice Corwine. Lydia writes Tom Baker is dead and will be buried in Delavan on Friday. I wrote Nellie Boswell. Sent birthday check and wrote Lydia. We rode to town after supper and came back past Emma Fellmans for my dress.